Recently Coca Cola's 2010 Chinese New Year's commercial officially go on show. Fahrenheit participated in the shooting of this commercial and starting from mid- January it will be broadcast in major cities across the country, finally allowing audiences to see. Unlike the previous New Year commercials, the audience watching from their TV screens not only will they be able to enjoy the festive cheer that Fahrenheit will bring on New Years Eve, but they will also interact with Fahrenheit through the web, allowing the completion of the Coca Cola 2010 Chinese New Year MV "The first taste"
Celebrating Chinese New Year, sticking up Chinese scrolls. In Coca Cola's New Year's short clip for the year of the tiger, naturally they cannot miss out one important segment. Fahrenheit even volunteered, with the 4 big kids lifting up Chinese ink brushes, creating four New Year scrolls that were full of joy but at the same time cutely mischievous. Calvin without a second of thought wrote "Happy everyday"*, Wu Chun sent out "Big happiness", Jiro immediately followed with "Cute and happiness" and last but not least Arron's was "Joy and happiness" . 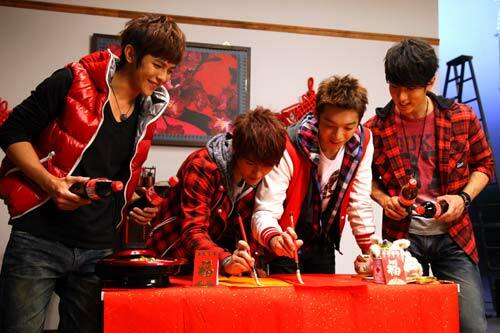 Gold letterings on a red background , passing it out is not only festive and pleasurable, even more so is Fahrenheit's enthusiasm and passion, and not to mention their deep love towards their fans. When discussing the new Chinese New Year commercial, Fahrenheit also expressed their happiness, "This commercial is really creative! While filming the commercial we were so at ease and it was so atmospheric. At the set the atmosphere made us feel as if we were celebrating Chinese New Year early. After being so busy for a year, right now we really want to welcome in the new year with our friends and family." Coming from Brunei, Wu Chun especially revealed what kind of food they ate back at home on the night of New Year's Eve, " In Brunei celebrating the New Year is very similar to China, after eating dinner on New Year's Eve, with my father, brother, sister, nieces and nephews we gather together bringing some snacks, sweets and nuts and also drink cola." 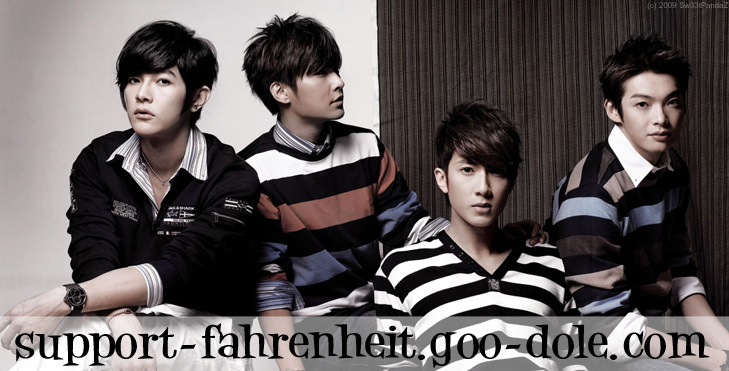 Fahrenheit in actual fact are just like normal people, when they don't have to preform they will definitely go back to be with their families, to eat at the family reunion dinner, enjoying the feeling of being reunited. "On New Year's Eve am most likely to be with my family, always happy, eating snacks , drinking Coca Cola watching TV together." Calvin said " It can be hard to meet up with good friends, we can only send each other text messages, giving blessings to each other. But after seeing this advert, everyone will know how to celebrate the New Year together even if you're not in the same place." In this Coca Cola commercial, Jiro will teach us how to celebrate with family as well as friends. "Young people have gotten used to the internet, on New Year's Eve the internet can help us fulfill our wishes of being together with friends." The weird and wonderful Jiro laughed saying "just like in the commercial, the four of us good friends celebrating together through the internet. When it reaches 12 O'clock on New Years Eve, we will toast with our Coca Cola, sharing the first taste of happiness, sharing the new year and a new beginning. 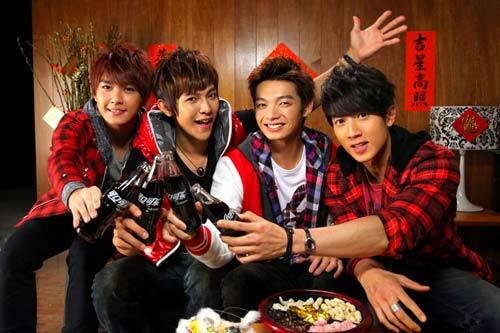 Fahrenheit for the Chinese New Year commercial preform together " the first taste of happiness", also inviting consumers to participate in the shooting of the MV. Through the uploads of video on their website, they will select the most creative style for passing the Coca Cola bottle, working together to create a New Year's MV that includes participating consumers. Fahrenheit said " We really hope the more people that join in the better, this will make it more fun and more interesting. Everyone can make a video to show their own skills, to show off their creative pass." 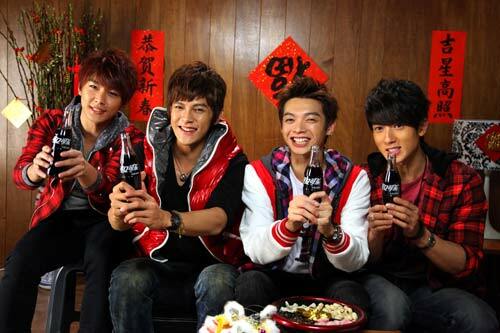 From the 11th January 2010, consumers can go onto www.icoke.cn to upload a video of the most most creative idea on how they can pass the Coca Cola bottle to each other, gathering consumers all around the world to join in with Fahrenheit to create the MV. Wu Chun suggested " to create an eye catching video you might need people to help with coordination to complete the pass, everyone can get co-workers, friends or even family to join in, this way the process of passing on cola can mean a lot more and even allow you to socialize and share the happiness. Calvin also added "when first starting you can do what we did and use something lighter to represent the Coca Cola, practice until you have mastered the technique and then you can use a coke bottle. Of course you can choose different Coca Cola bottles for example the aluminum can, glass bottle or even the plastic bottles. After shooting you only need to follow the upload instructions step by step on the internet and it should be done, this shouldn't be too hard for everyone!" Arron extremely excited and including the other Fahrenheit members are anticipating what techniques people will use in the videos, that will be extremely creative or overflow with clever ideas to help welcome the year of the tiger with them. In order to increase your chances of being selected Jiro reveals a little trick "during filming if you count the beats while moving this will help and also when editing the video it will be easier to join other groups onto it. In actual fact to make the passing movement more rhythmic and easier to edit, the director specially gave each of them for their shot a fixed beat count. Like counting beats in music, as well as preforming they must also coordinate in limited beat counts being cool, skillful and also use creative passing movements. But of course this was no problem for Fahrenheit, they each designed a complex movement to pass on the Coca Cola bottle, whether it was tossed and turned, from left to right each time they were able to stick to the required beat to finish the passing delivery. So basically, they have a new commericial that you can see on the 11th!!! obviously, they really promote coca-cola huh? i want to share happiness with you guyz!! !